Our recipe for this week is how to make ofada rice and stew. Ofada rice is the short, robust and brown rice planted in Ogun state, South-West Nigeria and some other States in Western Nigeria. It is identified with brown stripes because it is unpolished. When cooked, it emits the unique ofada rice aroma that is often the first attraction. 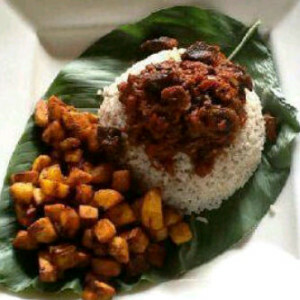 For health conscious individuals ofada rice is one of the preferred choices. Ofada rice is better eaten with a sauce. The most delicious sauce for the Ofada rice is known as Ayamase (also known as designer stew). I marveled the first time I saw someone preparing the sauce because until then, I never heard of it. This stew is commonly eaten with Ofada rice ( unpolished brown rice) and that is where it got the name Ofada stew. The unique difference from the other known ways of making the sauce is that while the others were made with red pepper, the Ayamase is made with green pepper. 1. Blend the Green Pepper with the ‘ata rodo’ and boil till it becomes thick. Remember not to blend the onions with the pepper. 2. While the pepper is boiling, cover the pot and bleach the palm oil for 8-10mins. Turn off the heat and leave the pot covered till the body is warm. 3. Once the pot has cooled, put it back on the heat and add chopped onions. 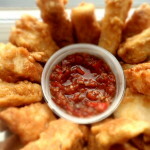 Let it fry till it softens, and then add the iru and let both fry until a bubble of palm oil comes up. 4. Add the meats stir and let it fry till the oil comes up. 5. Add the boiled pepper and stir. Let it fry until oil floats to the top, then you add stock, roughly 1 cup, stir and let it fry until you start to see oil on top. 7. Stir and let the crayfish cook and combine with the stew. Reduce the heat, and let the stew fry till the oil comes back up again. At this point, you can add boiled eggs/dry fish/cooked ponmo if you wish. Once the oil comes up, taste again for salt and seasoning. Enjoy with the boiled ofada rice (unpolished rice) or you can eat it with yam or fried plantain.